A 3 course dinner plus a bottle of wine at Camden Kitchen, off Camden Street, Dublin 8. With this exclusive offer from Rewarding Times and Camden Kitchen, we are offering a three course dinner for two people plus a bottle of wine for only €69. 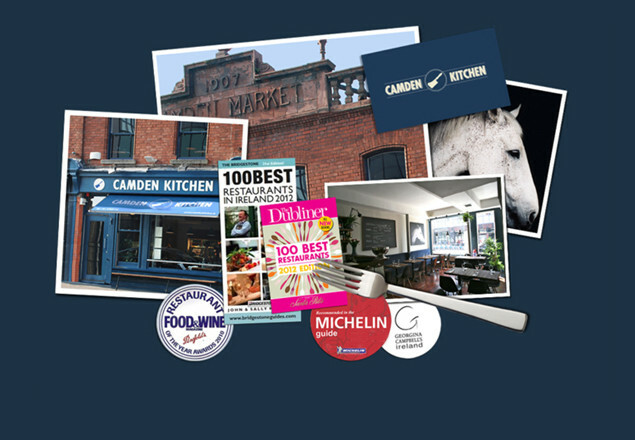 Camden Kitchen is situated in the historic Camden Market Buildings - a few minutes stroll from St. Stephens Green and the National Concert Hall. A Michelin rated Wild and Organic Seasonal Modern Bistro, Owner Chef Padraic Hayden and his team offer inventive seasonal dishes in a buzzing, intimate setting. Specialising in the very best of Irish seasonal produce, Camden Kitchen offers something different to the City's diners, making it a firm favorite with locals and visitors alike. Voucher is valid for two people. Limit to two vouchers per table per visit. Vouchers are valid Monday to Saturday from 5.30pm. Limited availability on Fridays and Saturdays. Vouchers are valid from 5th January until 31st March 2015 inclusive. Wine is either a bottle of red or white. 3 course dinner from the a la carte menu includes starters, main courses, desserts for 2 people plus one bottle of either red or white house wine.